Caption slip reads: "Photographer: Snow. Date: 1957-10-30. Reporter: Brown. Assignment: Litter. Special Instructions: Monday. 59-60: Trash along curb of old PE right-of-way in the 4700-block, West Venice boulevard. 47-48: Littered vacant lot on Centinela avenue near Teale street, Culver City area. Note beer cans. 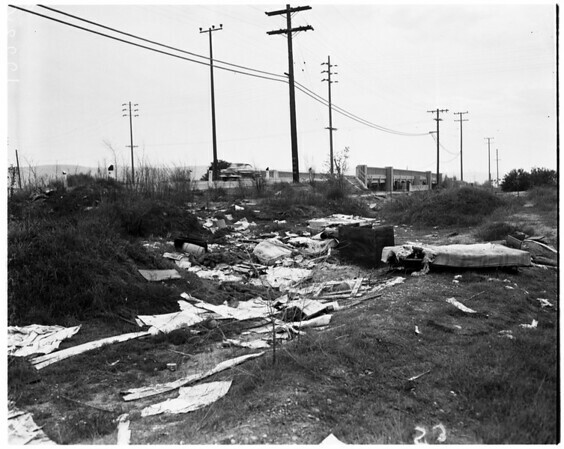 95-96: Roadside mess and 'No Dumping Here' sign on Culver boulevard near Ballona Creek. 3-4: Trash dumped near Culver-Lincoln overpass, Culver City area. Monday".